On the Road is a frenzied account of the adventures of the narrator, Sal Paradise, who drives, walks, and hitchhikes his way across the length and breadth of the United States in the late 1940s. Traveling with him are his friends, Carlo Marx, Ed Dunkel, Old Bull Lee and above all, the mad Dean Moriarty. These trips are largely aimless, the destination being decided on the fly, for no other reason than that one has to “dig” the streets of Denver, dig Larkin and Geary and Embarcadero in San Francisco, dig the jazz in New Orleans, dig Hollywood, dig penniless musicians and singers in decrepit bars, and dig women in all places. It is a mad romp that never looks like it is going to stop; for there are always more places that Dean has to see, more cars that he must steal (not out of malice, not with any plan whatsoever, but just as an outlet for his inexhaustible nervous energy), and more women to be inebriated with. Dean has all the energy in the world – He can steal two cars within half an hour, dance madly for hours unmindful of the pool of perspiration at his feet, make Denver to Chicago in seventeen hours in a “borrowed” Cadillac without any sleep, talking nonstop on the way. It has often been said that On the Road is a novel about the “beat generation”, but we seldom find an explanation about what it means to be “beat”. Kerouac once said that it means “beatific”. This invokes images of gods, sages, dervishes, hippies, drunkenness, and already, this amalgam is a little too complicated to pin down. But, while we find it so hard to define, we probably have a vague internal notion of what it means to be Dean and Sal. In a few areas of our own lives, we are probably like them. In their case however, the road is not merely a metaphor for life. The road is their life, their goal, their prize, their refuge, their anesthetic. 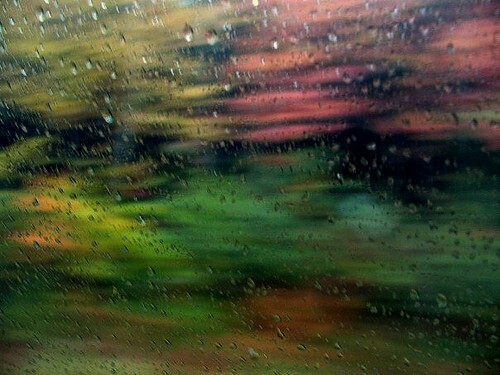 Undeniably, their lives are colorful, but the colors always blur into each other. Reading On the Road is a little bit like reading The Catcher in the Rye. I found it more engrossing than Catcher; for a variety of reasons that have to do with timing and age more than anything else, I felt closer to Sal than to Holden. I find myself thinking many times about Sal’s and Dean’s rueful admiration for the places that they travel to, and feel that I know some of the pain that they would not admit to themselves. They were, as Sal says, the mad ones – “mad to live, mad to talk, mad to be saved, desirous of everything at the same time“, and I felt that I understood at least a fraction of that madness – and the insane jagged helplessness that comes when the world just does not understand, when there are no kindred spirits to be found, when all of one’s talk is just words, tiresome and meaningless in the horrible void. Different people choose different entry points into a book – hooks with which they adhere themselves to the story, burrow inside it and look around; mine was the air of desolation behind the screen of ecstasy. “Wild sadness” describes the book perfectly. Before I read the book I had the impression that it was a grand adventure, a lark, great fun and all that. But it isn’t, it left me feeling sad and sorry for the characters because it never seemed like they found whatever it was they were looking for. Or maybe, they never figured out what the “It” they were looking for was. Wow, I just finished reading Big Sur, a deeply sad and haunting book. I’ve noticed increased attention to On the Road lately–an article in The New Yorker a couple of weeks ago which claimed “beat” was a carnival term for someone who has been beat down or marginalized. A follow up letter from MIT cultural history professor, Leo Marx, claims that Huck Finn was the first “road” novel to explore the relationship of men and the road (or in this case the river)and in many ways the books are similar because the explore the middle ground between complete conformity and total disenfranchisement. On the Road has moved up to second on my to be read list now, thanks to your post. But I’ll have to wait until I finish my current read, Huckleberry Finn. Stefanie, I spent the whole novel thinking about what Dean’s concept of “It” was. It is one of those slippery things which one thinks one knows but can’t describe. Interesting tidbit about the note from Prof. Marx, Ian. Huckleberry Finn is very enjoyable, as was his friend Tom Sawyer. I will try to get a hand on Big Sur. Sadly, even after living in California for 6 years, I didn’t visit Big Sur even once. Missed chances. BTW, I just followed the link to the sibling blog, and who should be there, but Emily, Queen of Memes! Quite a book-loving family you have, I must say.